Andrew St. Hilaire came to this final table as the chip leader, and he carried that chip lead all the way to the end. Amazingly, Andrew eliminated every player at the final table except for Suzanne Dines. With a strong rail of supporters, Andrew celebrated his victory, his $91,859 cash prize, and the trophy. Congratulations to Andrew, Daryl, and all of the winners of this $1,200 Mega Stack Challenge. Daryl Jace put all of his chips in preflop with [Qc][8s] and was in a race situation against Andrew St. Hilaire's [7h][7d]. Andrew yelled out, "One last race," before the dealer spread the flop [6s][As][Th]. The [2c] on the turn kept Andrew in the lead, and Daryl had one more card to stay in the tournament. The river [Kh] dashed Daryl's hopes, however, and he will finish in 2nd place, good for a $49,373 payday. 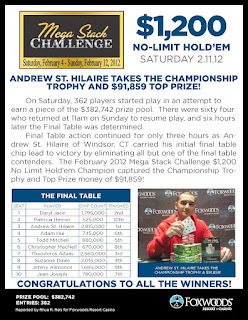 Theodoros Adalis was all in preflop holding [Ac][8s] to the [Ad][Kh] of Andrew St. Hilaire. When the board ran out [3d][6h][7c][3c][5h], Andrew claimed another victim, and Theodoros was eliminated in 3rd place. He will collect $32,342 for his efforts. A few hands after losing most of her chips with [Ad][Kh] against Theodoros Adalis's [As][Ah], Suzanne Dines was all in preflop and was called by all three other players. They all checked to the river with a board showing [Td][Ah][8s][5s][2d] and Daryl Jace showed AK to take the pot. Suzanne showed the [Kd] before shrugging her arms and collecting her $25,261 payday. On the second hand back from dinner break, Todd Mitchell was all in with [2d][2c] against the [Ad][Qs] of Andrew St. Hilaire. Andrew hit the flop once again when it fell [8h][Ac][Kh], and his pair of aces held strong through the [Qh] turn and the [5c] river. 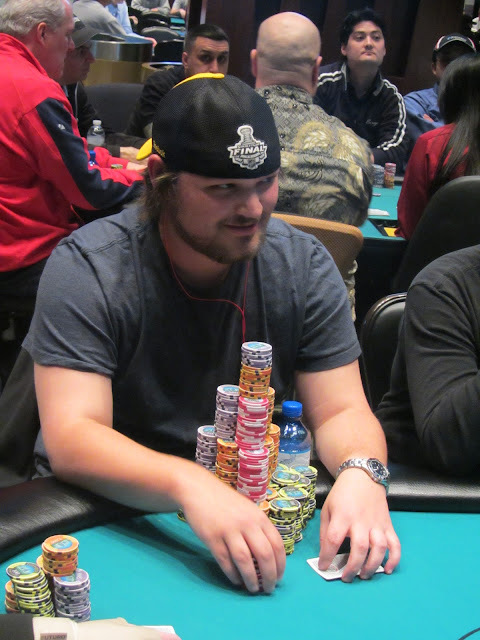 Todd Mitchell will exit the tournament in 5th place and will earn $20,668 for his efforts. Adam Hui was all in preflop holding the [Ks][Kd] against Andrew St. Hilaire's [Ac][Jd]. Adam looked to be in good shape to double up through Andrew when the flop fell [3d][6s][9d], and the turn [5c] changed nothing. But a brutal [Ah] on the river eliminated Adam on the last hand before dinner break, earning him $16,458 for his 6th place finish. Jean Elie "Téte" Joseph was all in preflop with [Ah][3d] against Andrew St. Hilaire's [6h][5h]. Andrew considered his lucky streak by hitting a pair on the [5c][8s][Kd] flop, and locked it up with the [6d] turn. The river fell an inconsequential [9c], and Jean Elie will head to the cage to collect his $12,630. Continuing his heater, Andrew St. Hilaire picked up [Ah][Ac] against Christopher Macniel's [As][Qh], and the two got it all in on a [Qs][Jc][8h] flop. The turn [5h] and river [3c] could not save Christopher, and he was eliminated in 8th place. He will collect $10,143 for his efforts. Adam Hui was all in for his 650k stack with the [Ah][Kc] and was up against the [8h][2d] of Andrew St. Hilaire. Adam hit an ace on the turn when the board fell [Qd][Th][Qs][As][4c], and he locked up the double up. He now sits on over 1.3 million in chips. Jimmy Alimonos was all in on a [6s][3s][Js] flop, holding the nuts with the [As][4s]. However, Andrew St. Hilaire had a lot of outs holding [Jd][Jc] for top set. All the suspense ended when the dealer dropped the [6h] on the turn, giving Andrew an unbeatable full house. He let out a large yell, and at the same time Jimmy got frustrated and knocked over his chair. The river [Ah] changed nothing, and Jimmy will collect $8,061 for his 9th place finish. Meanwhile, Andrew now sits on over 4.6 million, and was heard complaining to the rest of the table that they should help knock some people out. Christopher Macniel was all in preflop holding the [Ah][Kh] and was in great shape to double up against Andrew St. Hilaire's [Ac][8s]. The flop fell a devastating [4d][As][8h], giving Andrew two pair. The turn fell the [Qh], giving Christopher a backdoor flush draw as well as a king for an out. 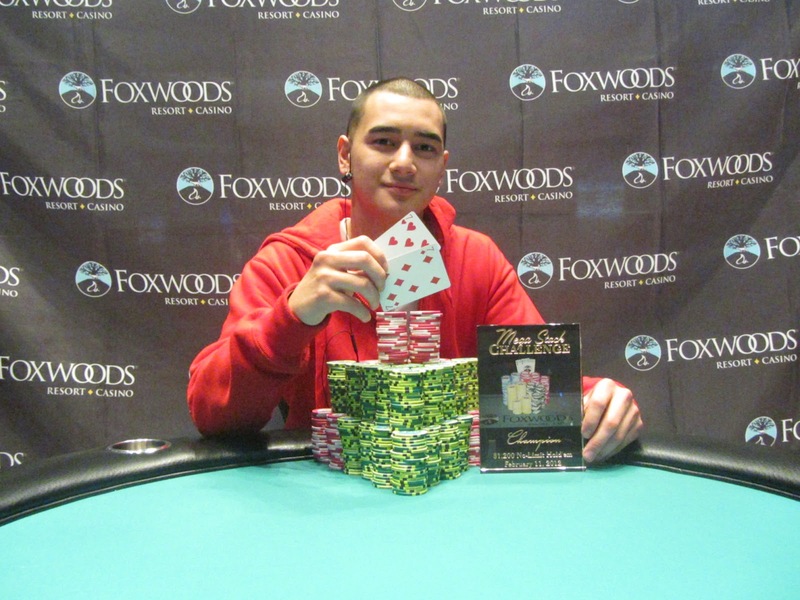 Lucky for Christopher, the river fell the [9h], completing Christopher's flush and earning him the double up. Patricia Herron was all in preflop holding the [5s][5c] against Andrew St. Hilaire's [As][9c]. The flop fell an exciting [8c][7h][6s], giving Andrew an open ended straight draw along with his overcard. The turn brought an even more exciting [8d]. This card meant a river five would no longer give Andrew the winning hand, but a six or a seven would counterfit Patricia's pair. The river fell the [Td] to give Andrew a straight, eliminating Patricia in 10th place, good for $6,315. $1,200 Mega Stack Final Table Reached! 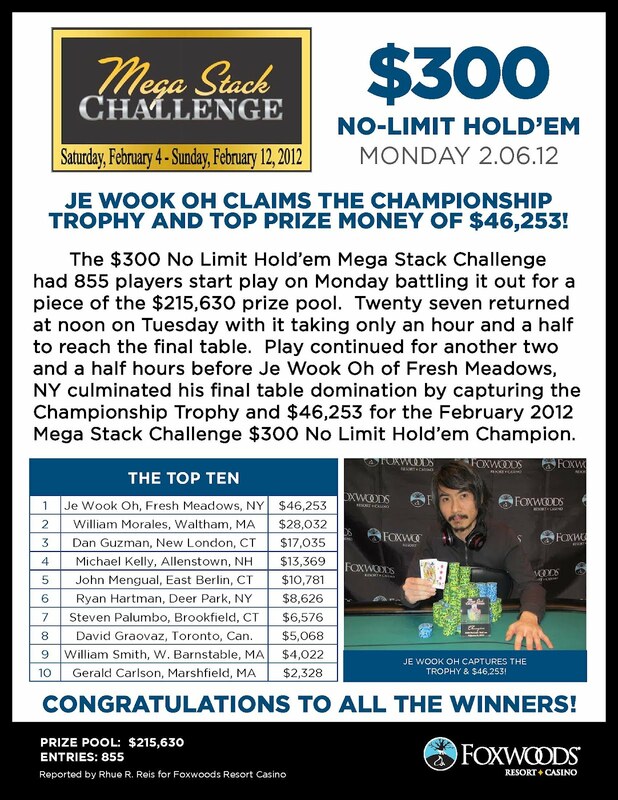 With the elimination of our 11th place finisher, the $1,200 Mega Stack Challenge has reached its 10-handed final table. We will have names and chip counts of all of our final table participants shortly. The 13 remaining players are on a 10 minute break while the tournament staff colors up and races off the 1k chips. When the field returns, they will be playing 15,000/30,000 with a 5,000 ante. Less than an hour and a half from the last table breaking, we are now down to 18 players in the $1,200 Mega Stack Challenge. The clock is paused at 10:15 in the 12,00/24,000 blind level while the players find their new seats. 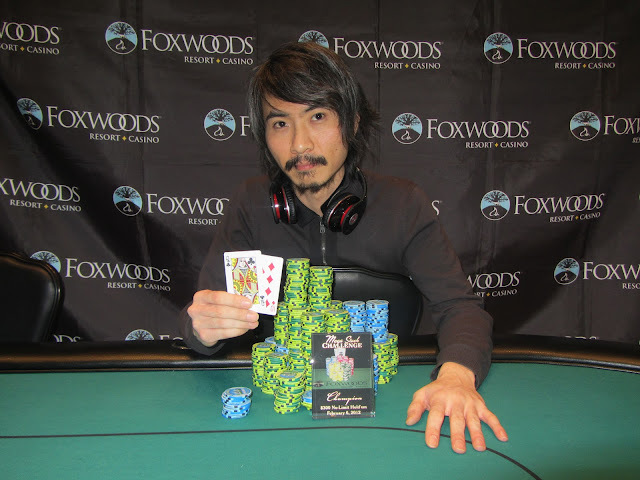 Three new players have taken their seats on the live stream table at www.FoxwoodsLive.com, and the tournament will continue shortly. With the elimination of our 28th place finisher, the final 27 are now set. The tournament staff are redrawing seats, which means there will be a new set of faces on our live stream at www.FoxwoodsLive.com. Play will continue at 8,000/16,000 blinds for another 22:14. The board reads 40 players remaining, and they are now on a 10 minute break. 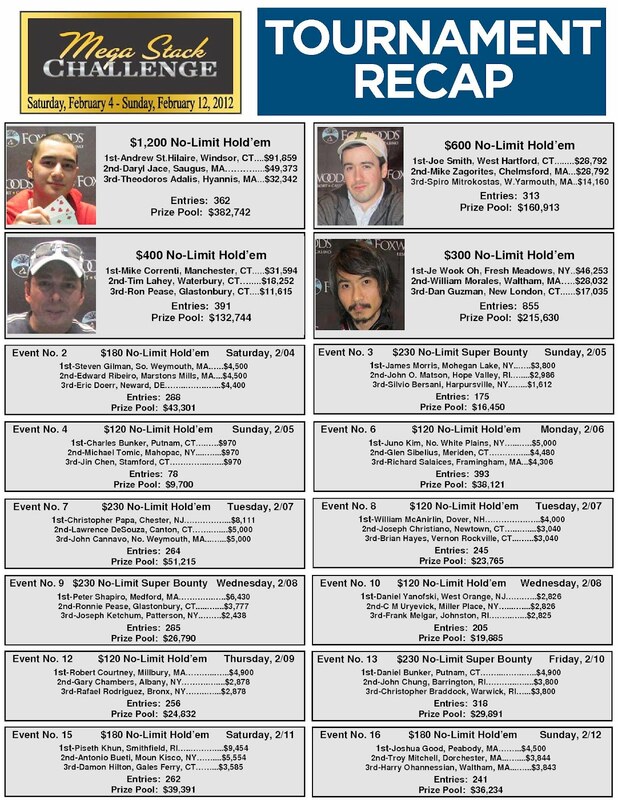 When they return, they will be playing 6,000/12,000 blinds with a 2,000 ante. With the elimination of our 46th place finisher, the remaining 45 players in the $1,200 Mega Stack Challenge are now in the money. Everyone in the field is now guaranteed $2,296, but all players have their eyes on the first place prize of $91,859. Cards are in the air for Day 2 of the $1,200 Mega Stack Challenge. There are 64 players remaining, and the top 45 will make the money. With 15 minutes left on the clock, the tournament staff has drawn a card to determine how many hands will remain. The card was drawn on the featured table, and the field will play six more hands before finishing for the night. They will return at 11am to restart the tournament. As of right now, there are 70 players remaining. The 102 remaining players are now on a 10 minute break, which is the last break of the day. The tournament staff are now coloring up and racing off the 100 chips as they will no longer be needed. When the field returns, they will be playing 2,500/5,000 with a 500 ante. Blinds have been increased to 2,000/4,000 with a 400 ante. Approximately 112 players remain in the field. 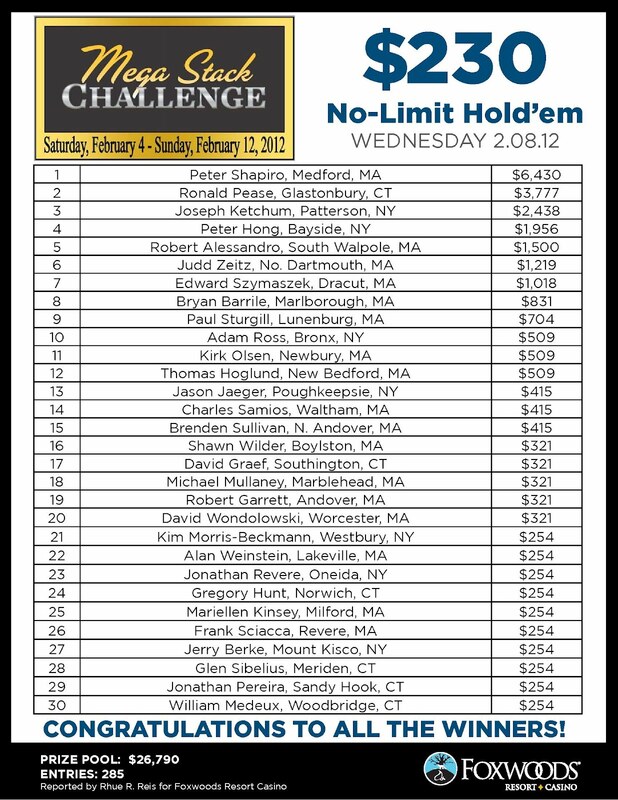 The remaining players from today's $1,200 Mega Stack Challenge are now on their 75 minute dinner break. 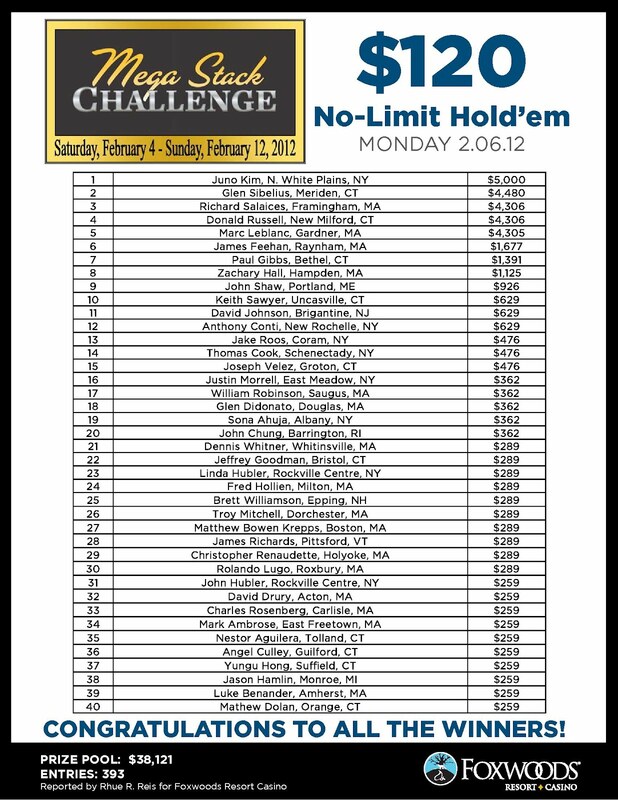 The 245 remaining players from today's $1,200 Mega Stack Challenge are now on break. When they return, they will be playing 500/1,000 blinds with a 100 ante. At 6:30pm, the tournament will take a 75 minute dinner break. Cards are in the air in today's $1,200 Mega Stack Challenge. This is the main event that everyone's been waiting for! Registration will be open for approximately two hours, so come down and register if you haven't done so already. As always, we will be streaming a featured table on our live stream at www.FoxwoodsLive.com, so tune in to watch the action unfold. Mike Correnti had a tough final table. He was put to really tough decisions, and at one point even laid down AK on an ace high board. But that laydown perhaps set the stage for his heads up battle with the same opponent. And a quick heads up battle it was! On the first hand of heads up play, Mike won a coin flip for 99% of the chips in play with AQ against pocket tens, and a few hands later it was all over. 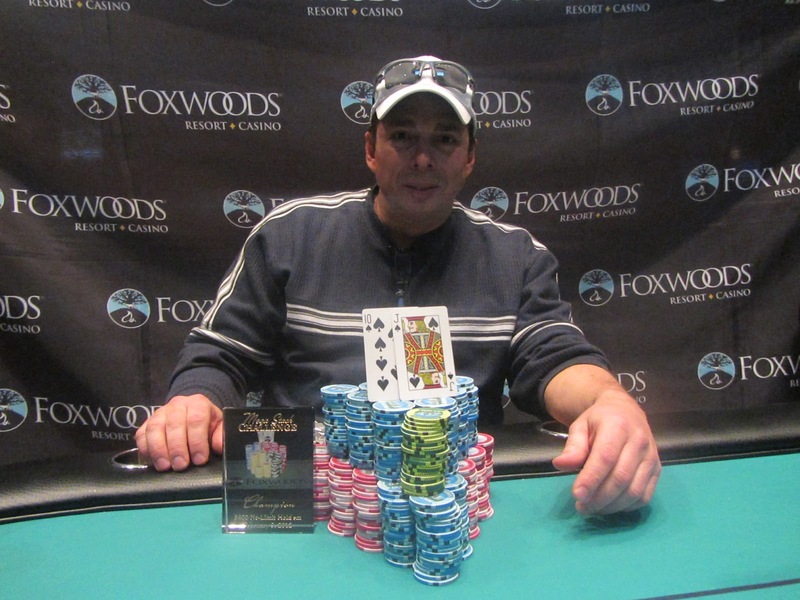 Mike will collect $31,594 for winning the $400 Mega Stack Challenge, and will go home with the Foxwoods trophy as well. Congratulations to all of the winners from this tournament! 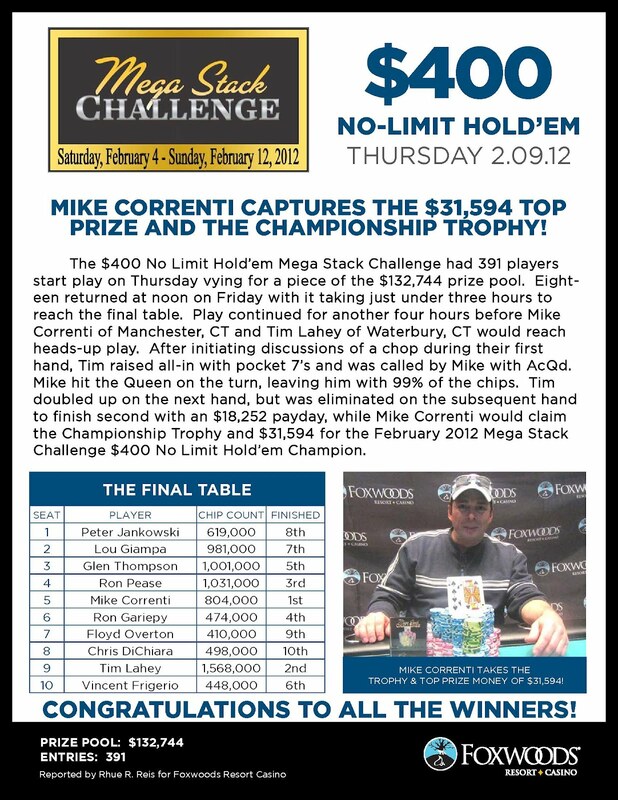 Tim Lahey and Mike Correnti were counting their chips and discussing a deal when they apparently started playing again. On the first hand of heads up play, Tim pushed all in from the button and Mike called him. Tim had [Ac][Qd] against Mike's [Td][Tc]. The flip was for almost all of the chips in play, and the board ran out [3c][7h][4h][Qc][Kd] to award the pot to Mike. The tournament staff counted down his stack, and Tim had just a few chips more than Mike. Mike put them to use in the very next hand, and doubled up on the river with [Ks][8c] against [Ac][4d] on a [Jd][Ts][Jc][2d][Kh] board. Unfortunately, his next attempt to double up didn't go as well, as Mike's [Jd][5h] was dominated by Jim's [Js][Ts]. Jim hit his pair on the [2c][As][Tc] flop, and it held up through the [9c] turn and [9s] river. Tim fought a hard battle, but will exit this tournament in 2nd place, good for $18,252. Ronnie Pease was all in preflop holding the [Ac][8d] against the [5s][5h] of Tim Lahey. It was a sweat all the way to the river as the board fell [7c][6s][Qh][3s][4c], but Ronnie failed to pair either of his hole cards and was eliminated in 3rd place, earning $11,615 for his efforts. Any chance of an exciting sweat on the flop was dashed when it fell [6c][6d][Kc], giving Mike an unbeatable full house. The turn [8h] and river [8c] only improved Mike's full house, and Ron was left with $9,292 to console him as he was eliminated in 4th place. Glen Thompson was all in preflop holding [As][7c] against Ronnie Pease's [Ad][3d]. The flop fell an exciting [9c][8d][Td], giving Ronnie a flush draw. Ronnie binked it right on the turn when it fell [9d], and Glen was drawing dead. The inconsequential [Js] on the river meant Glen was heading for the cashier's cage to collect $7,235 for his 5th place finish. Glen Thompson opened the pot before Ronnie Pease moved all in. Action folded back to Glen who thought about it, and eventually called with [3s][3h]. Unfortunately for Glen, Ronnie held the superior [8s][8h], and it stayed superior through a [Ks][6d][Td][Ah][Kh] board. Ronnie now sits on about 1.7 millon in chips. Vinny Frigeria was all in preflop holding [3h][3c] against the [Ah][Ts] of Glen Thompson. The flop fell [6h][Kd][Kh], and though Vinny asked for the dealer to "keep it clean," the turn fell [6c], counterfitting Vinny's pair. Vinny would need a king or a six to chop, or a 3 to win. It was not to be, however, as the river fell the [Jc], eliminating Vinny in 6th place. He will collect $5,840 for his efforts. Lou Giampa moved all in with [Qs][Tc] and was called by Mike Correnti, holding [9d][9c]. The [9h] was in the window, with the rest of the flop spreading [Qd][7s][9h]. The [Th] on the turn gave Lou 4 outs, but the [5h] wasn't what he needed. 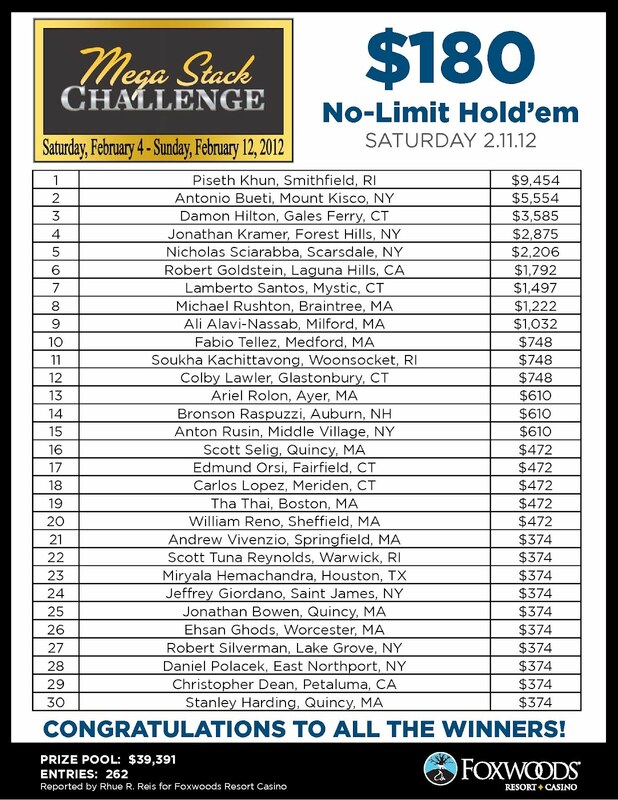 Lou will earn $4,845 for his 7th place finish. 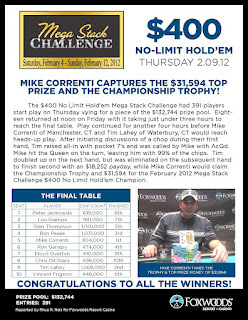 Tim Lahey raised preflop and Mike Correnti defended his big blind. On a [Ad][5d][5s], Mike check-raised Tim's bet, and then Tim 3-bet all in. This put Tim deep into the tank, and it was such a long decision that the entire table except for the two players in the hand got up from the table. Tim lifted his cards off of the table several times, as well as slammed his fist on the table in frustration. Amazingly, Tim decided to fold his [Ah][Kd], so we'll never know if Tim had him beat or not. Peter Jankowski was all in on a [6c][Tc][Jh] holding the [Kc][Jd] against his opponent's [Ac][Th]. The turn was a devastating [Ts], and the river [2c] did not save Peter from elimination. He will earn $3,916 for his 8th place finish. Floyd Overton was all in preflop holding the [As][7d] against his opponent's [3s][3d]. Floyd found no help on the [Qc][4h][Jd] flop, but he did pick up four more outs when the turn fell the [Kh]. Unfortunately the river [9s] did not hit Floyd's hand, and he will exit this tournament in 9th place, good for $3,203. In a blind vs. blind confrontation, Ronnie Pease and Mike Correnti saw a [3s][Ts][2d] flop. Ronnie bet out and Mike moved all in. Ronnie made the call and saw the bad news that his [Ah][Js] was outflopped by Mike's [Qh][Td]. Mike's hand held up through the [6h] turn and the [Kd] river, and now he has over a million in chips. Ronnie meanwhile still has around 800,000. Chris Dichiara was all in preflop holding the [Kh][Jd] against the [Ad][Qs] of Ronnie Pease. Chris got lucky when the flop fell [7h][Jh][4d], and the pair held strong through a [2c]. But the river [As] snatched the double up from Chris's hands and earned Ronnie the knockout. Chris will earn $2,190 for his 10th place finish. The final table is under way. Below are the seating assignments and chip counts for the final table. You can watch the live stream at www.FoxwoodsLive.com to follow this tournament all the way to a winner. Ronnie Pease knocked off a 3rd player in 3 hands, this time outracing his opponent's Q4 with his 33. That elimination left the $400 Mega Stack Challenge with 10 remaining players, who are now on brief break while the tournament staff counts down the chips. We will have seating assignments and chip counts posted shortly. We arrived to the featured table with a board reading [Td][Th][7d] and a huge pile of chips in the middle. Glen Thompson had raised the pot preflop, apparently, and Ronnie Pease called on the button. The flop went three bets according to our source, and when the [9d] arrived on the turn, both players checked. The river [Kh] brought an all in from Glen, and an eventual fold by Ronnie. Glen rapped the table, and eventually showed [Ac][6s] for ace high. Ronnie was visibly annoyed but knocked out two players in the next few hands with 99 vs A9 and AJ vs A7, so he can't be too upset. We heard some commotion on our featured table, and arrived to find Bob Carbone with his drink spilled ALL over his chips and the table. And when we say all over his chips, we mean it. As you can see in the photo above, the tournament staff had to stop the clock for both tables to assist in the clean-up job. Play will resume shortly with 17 remaining players. Cards are in the air for day 2 of the $400 Mega Stack Challenge. 18 players remain, and you can watch 9 of them on our live stream at www.FoxwoodsLive.com. The field will be resuming at 8,000/16,000 blinds with a 2,000 ante, and will be playing down to a winner today. 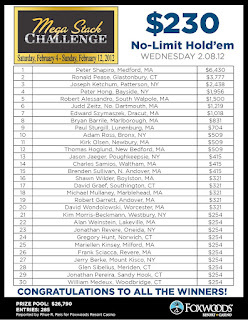 With 18 players remaining, play in today's $400 Mega Stack Challenge is complete for the night. The tournament staff will redraw seats for the players, and they will reconvene at 12pm EST. Full chip counts and seating assignments will be posted shortly on http://www.FoxwoodsPoker.com. Follow all of the action tomorrow on the live stream at www.FoxwoodsLive.com.